It’s extremely easy to make an image transparent with the help of Preview app, the built-in image editing app that comes along with all Macs with Mac OS X. Do note creating transparent PNG or GIF images this way works best on images with uniform colors in the area you want to become transparent. The more complicated the image and color variation, the more work you will need to do with the alpha tool to make a portion of the image transparent. You can turn any image transparent with Preview, though you’ll find the resulting image must be saved as an image format that supports transparency. To get the finer details transparent it can help to zoom in and out of the image using Command+Plus and Command+Minus keys. If the original file was a PNG or GIF and you are satisfied you can just save as usual, but in a lot of cases you may not want to overwrite the original file. Instead, you can save the newly transparent image as a copy by using “Export” or “Save As”. PNG files are much higher quality than GIF, and for most uses you’ll want to use a transparent PNG, but we’ll cover both how to create and save as either transparent GIF or PNG anyway. Because you’ll need to perform manual adjustments with the alpha tool, this would not work on a group of files, though you could batch convert them ahead of time to PNG or GIF, then open each individually to make them transparent. You can make transparent images in Preview for Mac with nearly any version of the app this way, whether you’re in a modern macOS release, or an earlier Mac OS X version, the Preview app can create transparent gifs and transparent PNG files easily. Just remember to look for the Toolbox button in modern Preview versions and the Pen button in earlier Preview releases. Wow, do you guys even proofread before posting? Sometimes we miss things, but that’s what you’re for! @Koolmajicguy: Wow, do you even think about being a bit less of an azzhole when pointing out mistakes? Has apple done it again and removed an interesting feature ? 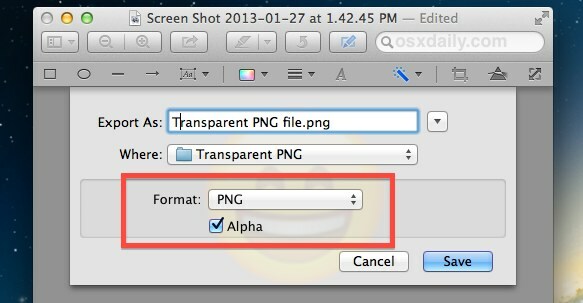 I no longer find the instant alpha in Preview Version 7.0 (826.4) (MacOS 10.9.2) ??? I have nothing under “Smart Lasso”, even when I open a PNG file which should support Alpha layer. Instant Alpha is still in Preview under OS X 10.9.2, you must open a file and show the Edit Toolbar first though, then select the magic wand to use. wow.. its so simple… i thought i need to download some photoshop to do it.. thanks..
Every time I export to png, tiff or jpeg, I still get a black background, rather than transparent. Is there some preference I need to set? Thank you. It worked like a charm! I am using Yosemite. The option Instant Alpha does not appear in that drop down list. It works under Yosemite, from the view menu select “show markup toolbar” select wand (second from left in the tool bar) and select teh portion of image and then cut as described above. Great ! I’ve been using this for years for signatures, so I can just paste the signature image on a document and don’t have to print, sign, scan, send. Also the occasional image. However, recently I’ve noticed that the foreground becomes translucent and if you paste it on another image. You can see a little bit of the background image through the foreground of the transparent png. Any idea? Thanks. Thank you!! I love it when people make things so simple for me. This worked like a charm!! I can’t see the edit icon with the pen on a rectangle in osx el capitan, even under annotate. Have they removed this feature? Am very disappointed with El Capitan – this new $3000 laptop is virtually useless. Used to be an Apple fan, when it all just worked. Agree with wow comments about simple – thanks to your explanation. The magic wand moved in Preview, but the rest works as described. Huge thanks! Sweet, thanks… very simple and the funny thing a windows guy gave me this simple logo to modify because he knows the Mac is just better in these things… my quick search since I didn’t know how to do it, lead me here. Thanks for posting! I don’t get it. When I do step 5, the image is simply deleted. It doesn’t become transparent, it’s just gone.